For the last event of the year Timmy van Zoelen presents the performance The Whale’s Ear (2014), and the teaser trailer for his new film They Humiliate The Human. 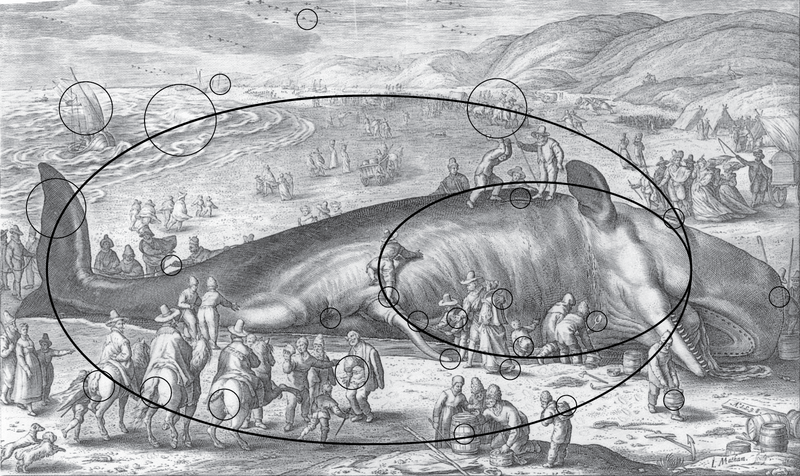 Image: Whale Stranded at Berckhey, copper engraving by Jacob Matham after Hendrick Goltzius, 1598. This multimedia performance is a speculative reading of an etching by Jacob Matham titled ‘Whale Stranded at Berckhey’. In Van Zoelen’s upcoming film, which he is developing as a result of his research period in New Orleans, the male voice of the artist takes us through his existential account of time travel by way of slurping energy drinks. Eventually They Humiliate The Human will be the result of a series of sensual phantasies exploring the voluptuousness of time-travel through object-oriented power relations.